Passengers had to be led to safety when a double decker bus caught fire in south-east London. London Fire Brigade was called to Pepys Road in New Cross at 08:22 GMT to reports of a bus and car alight, a spokeswoman said. 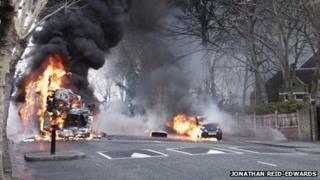 Transport for London said the driver helped passengers off the 343 bus and no-one was injured. Resident Jonathan Reid-Edwards said he heard a big bang from his bathroom. The fire was put out by about 09:20 GMT and the cause is under investigation.